Free Shipping Within The Continental U.S. | Ships within 10 days. Select ... 4" 6" 8" 10" 12" 14" 16 18" 20"
Through-Wall Payment Drop Box for 200 payments. Envelope Depository Unit: A locked chest that is 8 x 24 x 12 inches wide and made of heavy gauge steel that is finished in beige. Access door is 7.25 x 7.75 inches wide. Registered lock and (2) keys included. Stainless Steel Head 7.5 x 10.75 inches wide and has a protective rainshield and weatherized liftplate. Slot opening is .625 x 6.25 inches wide. (2) threaded studs are welded on back to fasten securely to chute brackets. (2) black signs: "ENVELOPE DEPOSITORY" or "PAYMENT DROP", and "LIFT TO DEPOSIT" included. 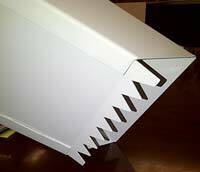 Delivery Chute 2.5 x 6.75 inches wide, cut to fit your wall depth, continuously welded to locked chest and finished in beige. Please note, brackets on each side of chute increase overall width to 8.25 inches wide. Anti-fish teeth welded at end of chute prevents fishing. Your wall depth must be measured at the time of order to indicate the correct chute length. The wall depth also determines the height of the slot (please see cut sheet below for detail). ADA requires a 48" maximum height to the center line of the slot. Your wall depth measurement is needed at the time of order to allow for a proper thru-wall or in-wall fit. Attention Contractor: rough opening is 4 x 9 inches wide. Wall depth measurement is needed at the time of order. Install in accordance with your state and local fire codes. 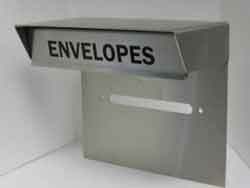 Integrated Envelope Holder (Optional 0805): All heavy gauge stainless steel, 11 x 9.75 x 6 inches deep. Storage cavity is 10.875 x 2 x 4.5 inches deep. Holds approximately 50 envelopes. Black sign on liftplate reads "ENVELOPES". Anti-fish teeth at the end of chute prevent fishing. 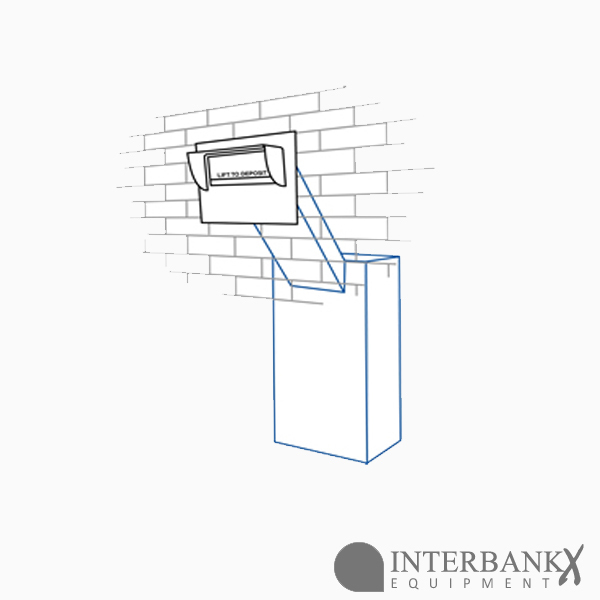 Envelope Deposit Unit can be installed in either a thru-wall or in-wall setting. 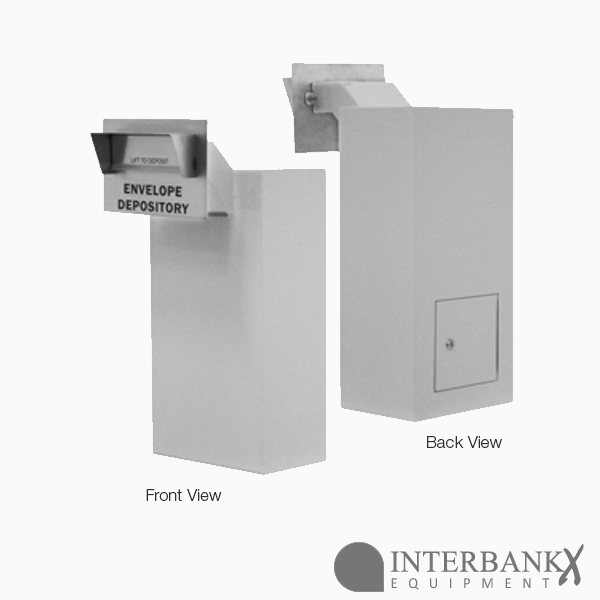 The clear opening for attaching the Exterior Stainless Steel Head to Interior Envelope Chute should be 4" H x 9" W.
Drop Boxes are provided for customer convenience. 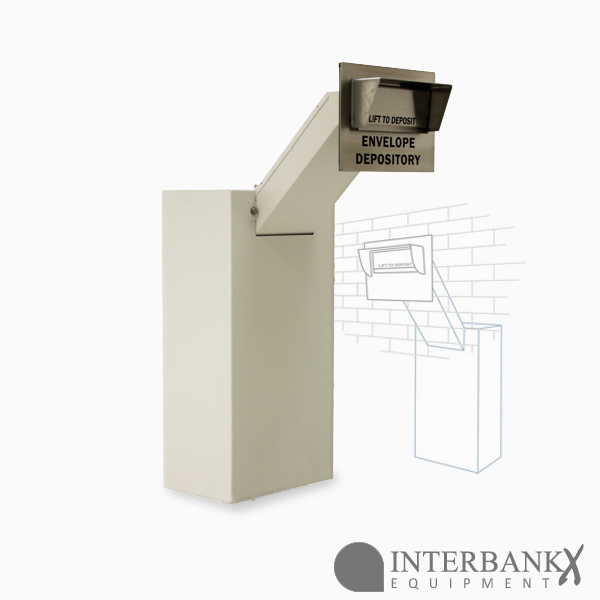 Drop boxes are built using a heavy gauge stainless steel and offer some “fishing” deterrents. They are not TL rated safes and make no claim to stand up to uninterrupted attack with burglary tools or other fishing devices. 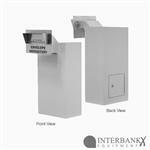 We recommend that you consider a TL-15 or TL-30 High Security Safe if security is a high concern. Access Door: 7.25 x 7.75 inches wide. Delivery Chute is 2.5 x 6.75 inches wide, cut to fit your wall depth, continuously welded to locked chest and finished in beige. 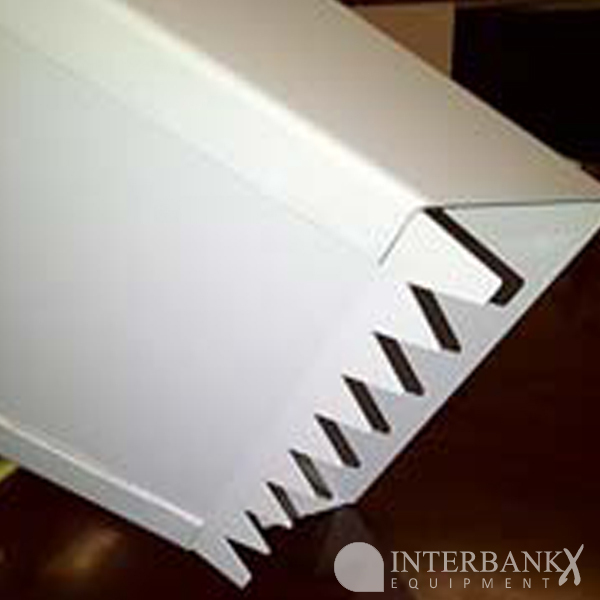 Please note, brackets on each side of chute increase overall width to 8.25 inches wide . 1. Prepare 4x9 inch wide rough opening on exterior wall. 2. 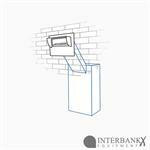 Secure payment chute to receiving chest. 3. From the interior, slide assembled chute and receiving chest through the wall to where open end of chute is flush with exterior wall. 4. Level and shim chute within exterior wall. 5. Fasten chute/receiving chest to interior wall if desired. 6. Install SS EDU head to chute using hardware included. 7. Insulate and weather seal as your location requires.